in the war on terror and then he was for it. qualified candidate for the Supreme Court? we would be able to diversify away from foreign dependence. fix we’re in.” As is so often the case, Bush was lying. form of a mushroom cloud." shattered state left by U.N. inspectors in the 1990s." the information from British sources. of mass destruction' it was looking for." weapons, United States government officials said today. saying that their mission was accomplished." record of $290 billion posted by Bush's father in 1992. 2004 is due to the lackluster economy. 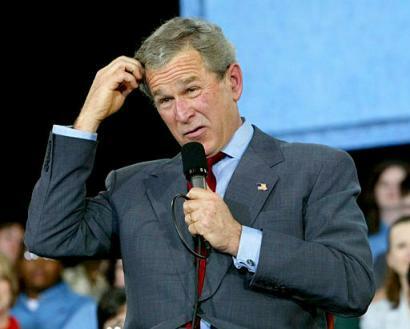 [Bush speech, "A Comprehensive National Energy Policy,"
then he is against it. then he's against them again. then he pushes for a "road map" and a Palestinian State. then he is for changing the constitution. (fire, police, emergency), then he doesn't. then secretly starts drilling on Padre Island. Bush first says the U.S. won't negotiate with North Korea. Bush goes to Bob Jones University. Then say's he shouldn't have. whether to sanction military action against Iraq. Later Bush announced he would not call for a vote. the sailors. Bush later admits it was his advance team.